Following the well-attended foot workshop, Karyn Marais continues the journey from the feet into the pelvis. She will guide you through steps to finding a balanced pelvis. 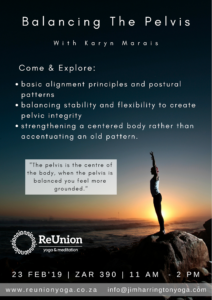 The pelvis is the centre of the body, when the pelvis is balanced you feel more grounded. -basic alignment principles, experiential anatomy of pelvic alignment, front to back, left to right, deep front line to lateral. -balancing and strengthening the deep core, strengthening a centered body rather than accentuating an old pattern. -the art of walking, drawing in from what we have covered above we look at the natural movement of the pelvis in our evolutionary bipedal gait as we stride with one leg in front of the other. Karyn Marais is a body alignment therapist and yoga teacher. She is passionate about finding ways to move with less effort and more ease in life. Her work is grounded in what she has understood through various bodywork modalities, and her own movement practices, including yoga and natural movement. She has a particular interest in sharing the benefits of healthy strong feet and a balanced pelvis.